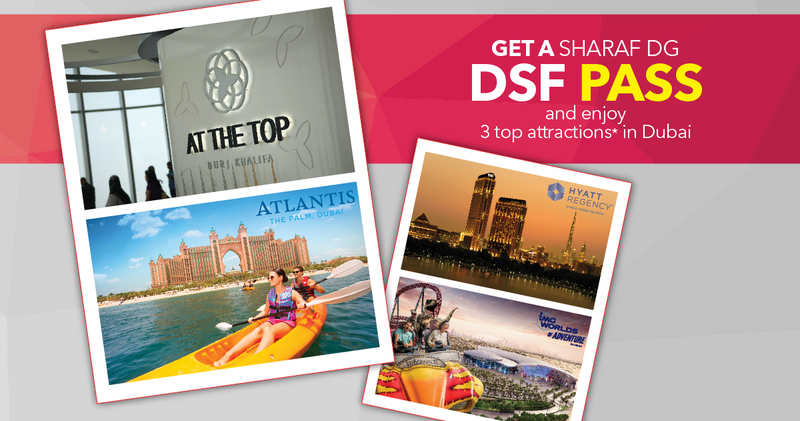 Get Sharaf DG DSF Pass absolutely FREE! Offer valid only till January 26, 2018. Terms and conditions apply. 1 customer can avail any 03 attractions (tour/meal) within 05 days from the date of first tour/meal. Validity of voucher is until 12th Feb, 2018. This promotion is not valid in conjunction with any other campaign. The voucher cannot be commercially/financially sold or exchanged in cash. All bookings require prior reservation by email. All tours are excluding transfers. All meals are either buffet or set menu without any beverages. All bookings and fulfilments will be done by Lama Tours LLC. Scan your voucher & provide your first choice of tour/meal with date at sharafdsf@lama.ae. Booking confirmation will be sent by email within 24 hours after receiving scanned vouchers.